There’s something about pizza that’s irresistible. Who can just stop at one slice? Especially kids! Seriously, put a large pizza in front of two kids and it will be gone in approximately 5 minutes… then they’ll want cupcakes immediately after. How do they do it?! Bottomless stomachs. I’d love to go back to that carefree world and eat a whole pizza for breakfast. I ate bagel bites alllll the time when I was a kid. Cute, delicious little pizza bagels is what they were. And let’s not forget about stuffed crust pizza! Too good. But please NEVER eat a pizza crust stuffed with hot dogs… that’s just disturbing. 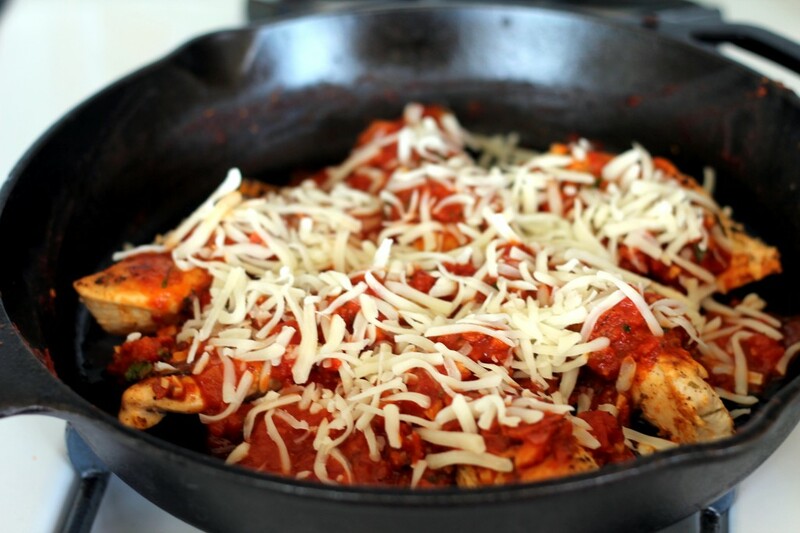 As perfect as pizza can be, in any shape or form, I’ve never been a huge fan pepperoni; however, I made a spicy pepperoni tomato sauce, spooned it on top of skillet chicken, and topped it with mozzarella cheese. MIND BLOWING is what it is. WHAT? The sauce is DAMN good. Quite possibly now the love of my life. No big deal though, I’ll walk you through the deliciousness so you can experience it for yourself in less than 30 minutes! 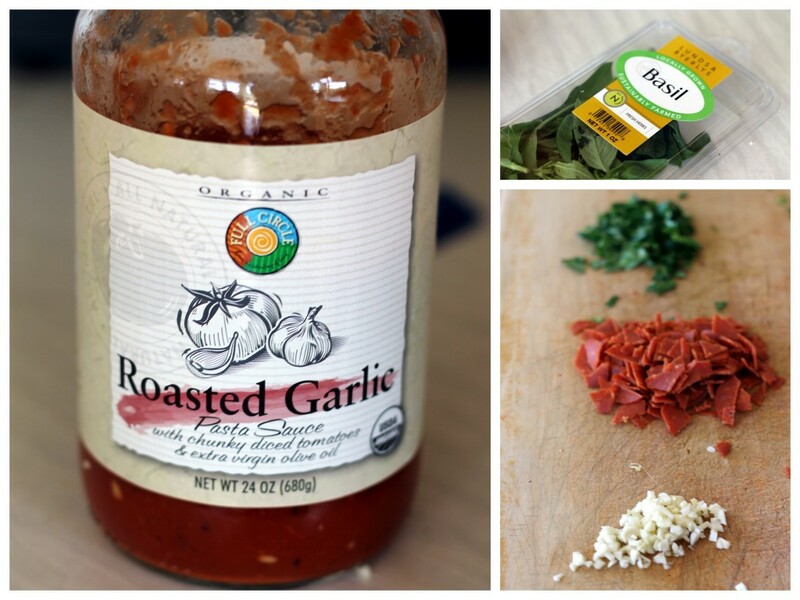 First we start with the best ingredients for the best sauce: roasted garlic pasta sauce (any type of tomato sauce would work such as marinara), fresh minced garlic, pepperoni, oregano, and fresh basil. Saute pepperoni and fresh garlic for a few minutes. Savor the smells. Note: I used turkey pepperoni; it tastes the same but has half the fat and calories of regular pepperoni. You can usually find it at your local grocery store. 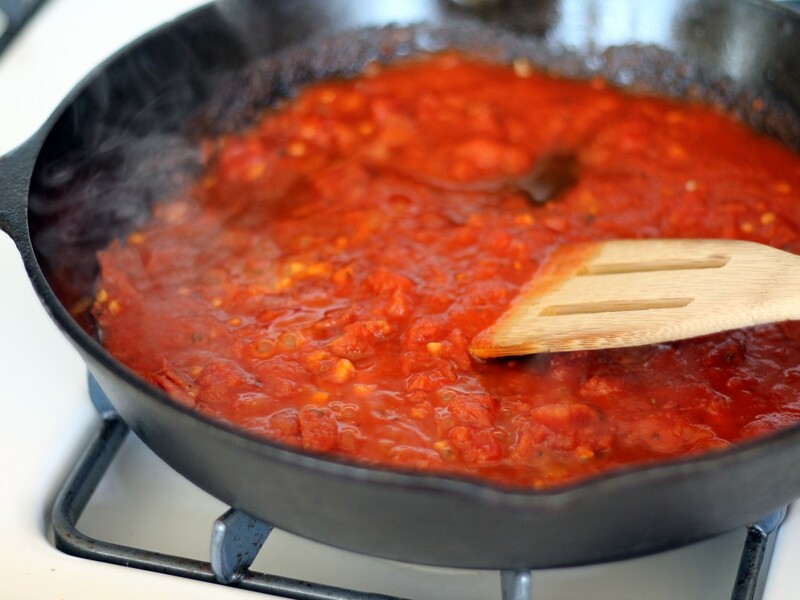 Next, add your pasta sauce to the pan and add oregano. Look at that steam rising! 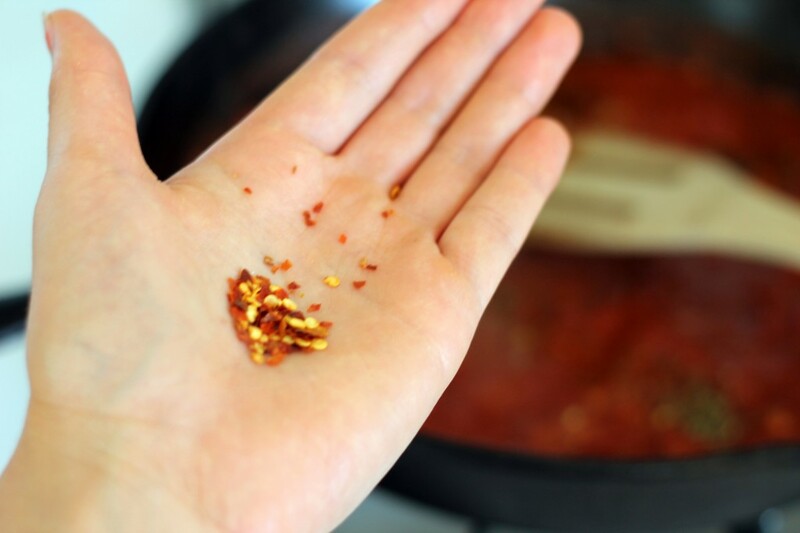 Add red pepper flakes if you desire to make the sauce spicy, otherwise you can leave them out. But please do add them. My motto: Spice up your food, spice up your life! Now we add in the million dollar basil. Stir, and get a little obsessed. Set the sauce aside. 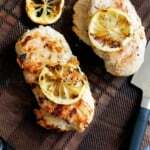 Sprinkle chicken with black pepper and cook in a skillet until golden brown and juices run clear. Once chicken is cooked, spoon the pepperoni sauce on top. Resist the urge to just eat the sauce by the spoonful. I have no willpower sometimes. 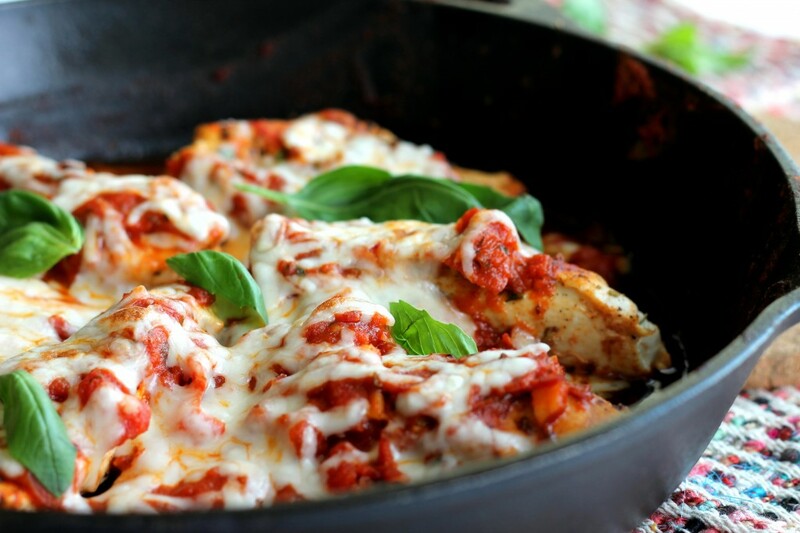 Add cheese and place the skillet under the broiler for two minutes. 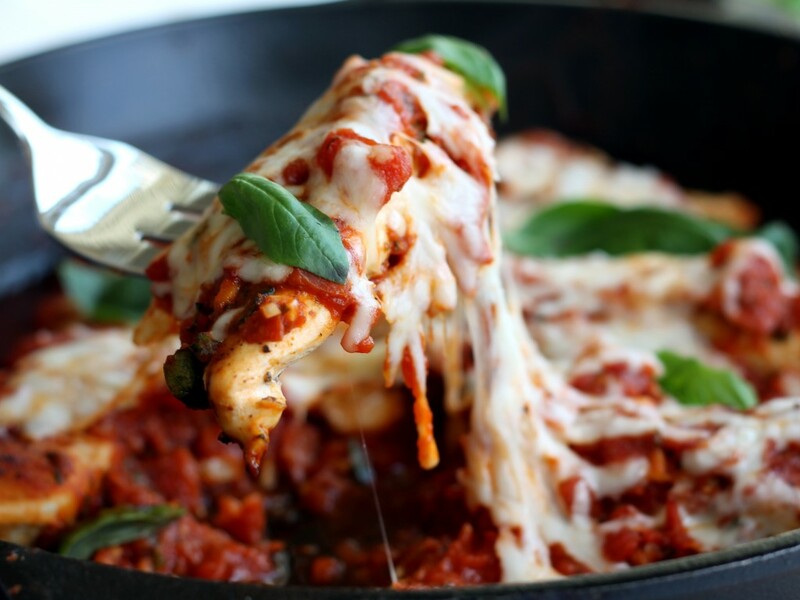 Remove and garnish fresh basil leaves, extra cheese, and/or extra red pepper flakes! Even though I’m not a parent, I know that it can be difficult to find healthy meals that kids will enjoy. Just trust me on this: put something in front of them that tastes like pizza, and you’re golden. 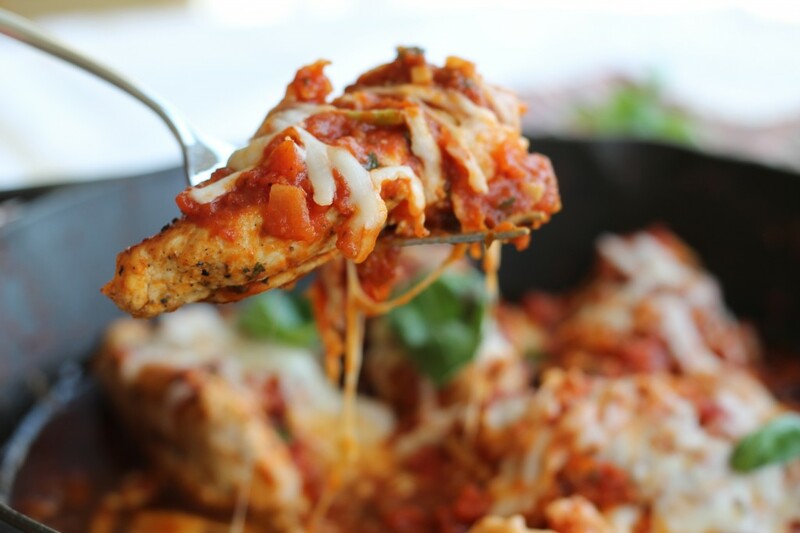 Using reduced-fat cheese and turkey pepperoni makes it even better for them and you! Of course there are endless possibilities with this: Throw it on top of pasta or stuff it in a whole wheat pita (pita pizza)! 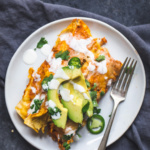 It’s a truly simple, healthy weeknight dinner that can be whipped together in a flash. I’m all about that. Something else I’m all about? That Magic Mike movie. Drool. Heat a saucepan over medium-high heat. Coat pan with cooking spray. 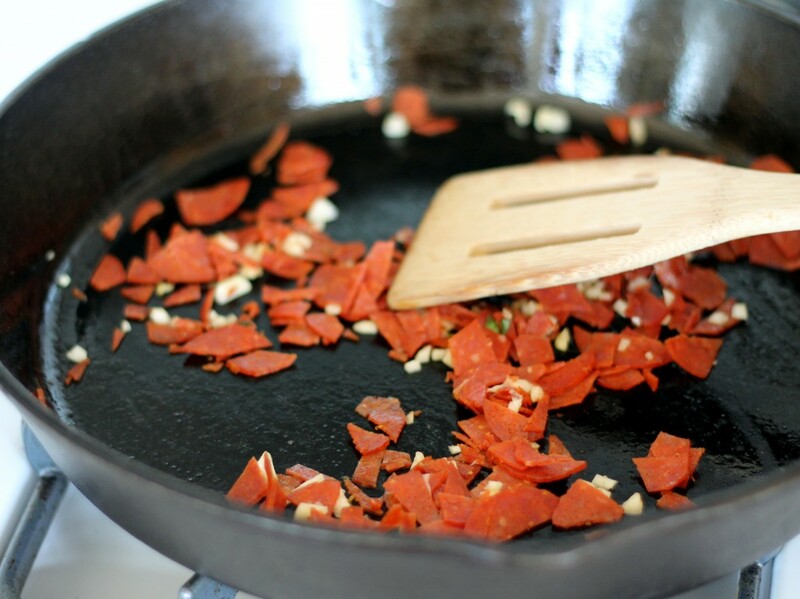 Add garlic and pepperoni; cook 2 minutes or until garlic begins to brown, stirring frequently. Add oregano; cook 30 seconds. Add tomato sauce; bring to a boil. 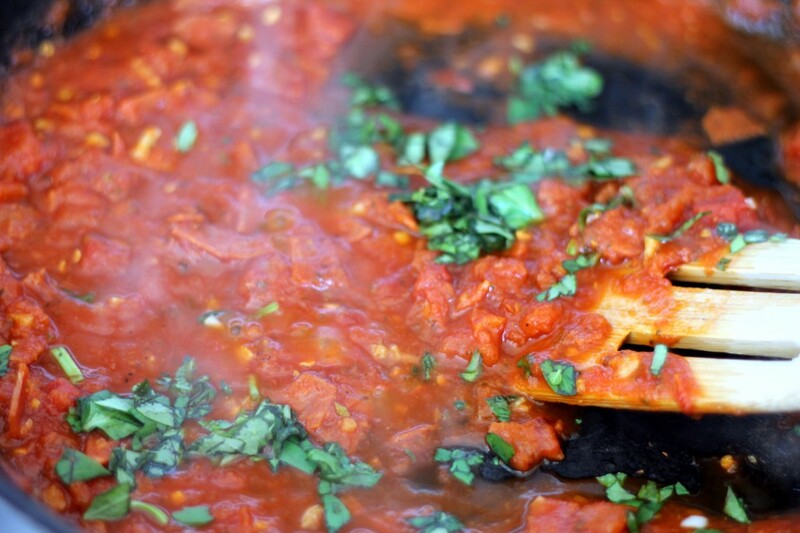 Reduce heat, and simmer 5 minutes. Remove from heat; stir in basil. Heat a large ovenproof skillet over medium-high heat. Add oil. 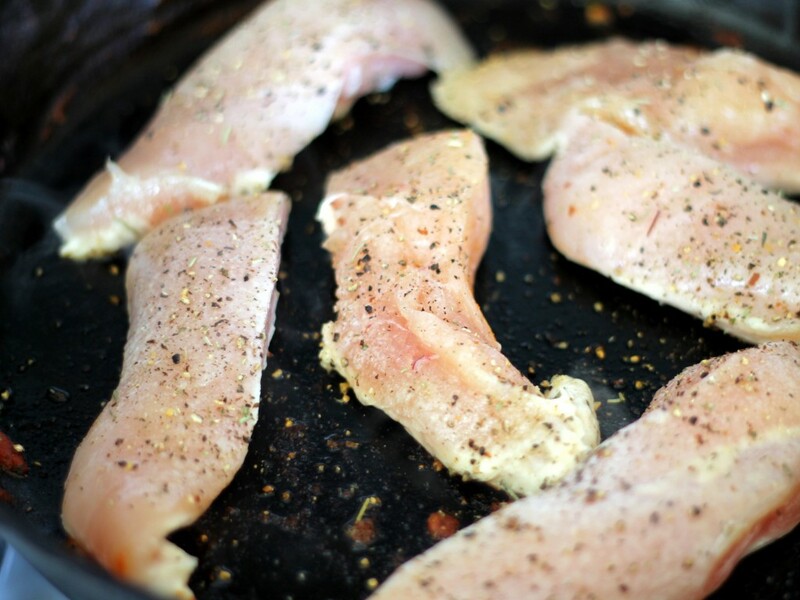 Sprinkle chicken with pepper. 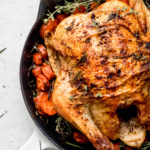 Add chicken to skillet; cook 5-6 minutes or until lightly browned, turning after 3 minutes and cook until chicken juices run clear. 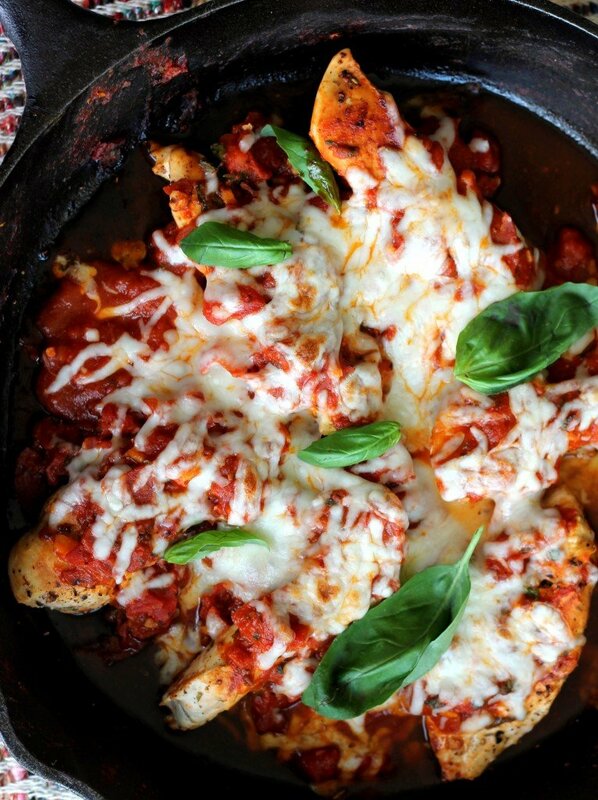 Spoon sauce over chicken; sprinkle evenly with cheese. Broil 2 minutes or until cheese melts. 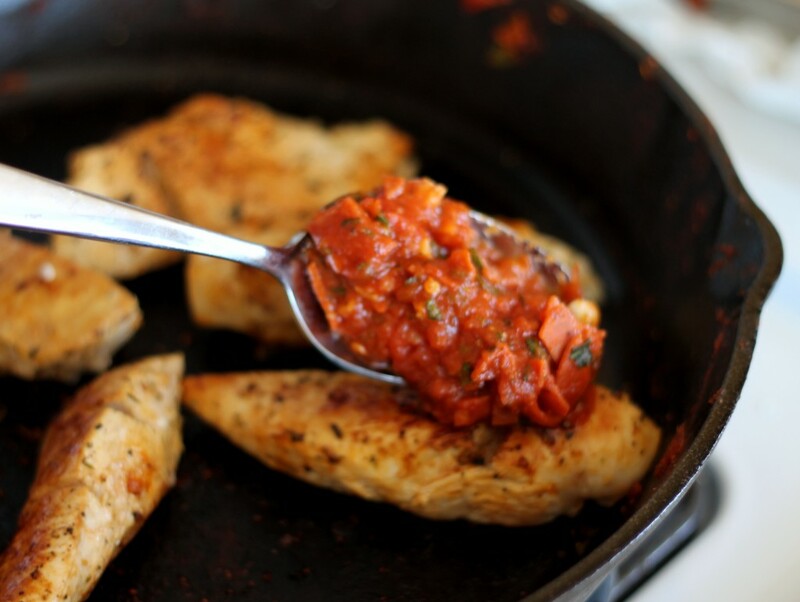 18 Responses to "Skillet Chicken with Spicy Pepperoni Sauce"
This is making my mouth water! It’s really hard to find anything naturally gluten-free in italian cuisine without feeling like it’s missing something. 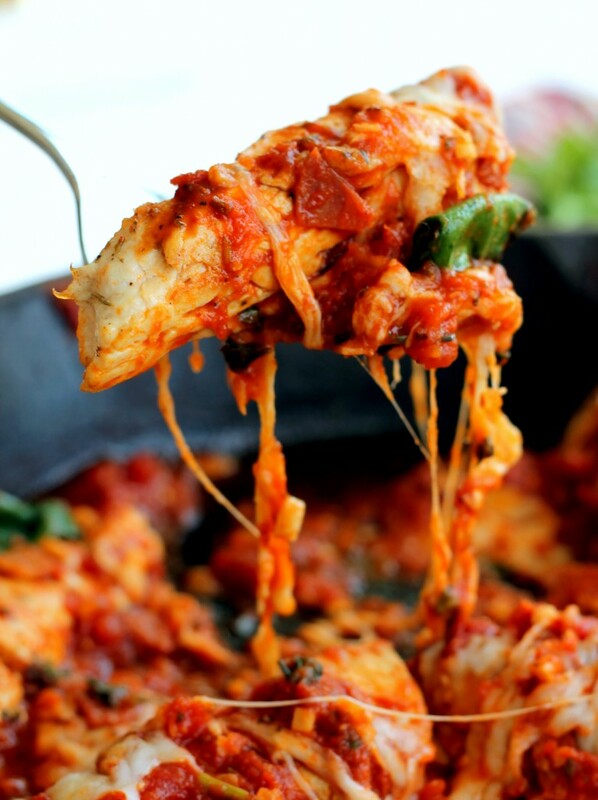 I feel like I could make this for friends without fussing over separate batches of pasta! Thanks! Oh my word! Mouth watering! Oh my gosh. Yum. Now I want it for breakfast!! Love the addition of pepperoni to the sauce! Mmmm, Mike Isabella and Graffiato have made me a huge believer in pepperoni sauce. I love this. OMG! I had to wipe off my keyboard so I could type this. I ran to the freezer and got some chicken breast out. This will be on the table tomorrow night! 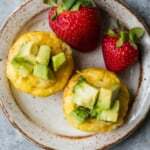 I love a recipe that I already have all the ingredients, no waiting to run to the store, thank you for sharing with the rest of us. Pinned! I love this! 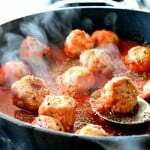 I just came across a pepperoni sauce recipe last winter… so good. I made this last night and was surprised at how quick and tasty it was. The pepperoni really added great flavor! So glad you loved. It’s a keeper. OMG! Can’t wait to make this! It’s delicious! Added a little red pepper flakes to sauce. This one is incredible!! My father in law lives with us ( who doesn’t care for anything healthy) and he LOVED this! 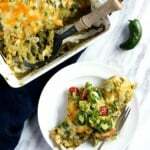 I’ve tried several of your recipes and he and my husband have loved all of them, even the vegetarian dishes. It’s blowing my mind! Haha. Thank you! I have a confession to make…. This is my first time EVER leaving a comment on a food blog. But when I saw this recipe, I just couldn’t resist. I am so excited to make this recipe for my fiancé!! This dish looks right up his alley and I already know he will be going back for seconds (or maybe even thirds)! 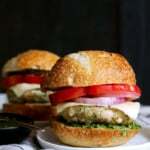 I LOVE cooking and I am so happy to have stumbled across your blog. I’m sure I will be changing up or making additions to every recipe (I never follow recipes exactly)… Anyways, love your blog! Going to make this for my wife tonight. Hope she likes it and myself for that matter. Looks amazing!